I am a bit obsessed with George Michael’s “December Song (I Dreamed of Christmas)” at the moment, and it has caught me a bit off guard. As I posted last Christmas (pun abused, reused, and still intended), this song was George’s Christmas present to the world. However, for those of you who didn’t wake up on Christmas day and run straight for your laptop or desktop, you can now pay for the privilege of owning this track, along with a few other treats if you’re very good and want to pay out a few extra coins. Enough of the logistics, though…let’s get to the song in question. When I first heard the opening strains of something straight out of It’s a Wonderful Life, I thought someone was playing a joke on me. But the piano and sleigh bells kicked in, and I instantly knew the source. If you pay attention to the structure of the intro (and the chorus), you can hear a slowed-down version of “Last Christmas”, but once you hit the first verse, it’s George circa Older. The video, which on the surface is an escape for a child facing a potentially disappointing Christmas, actually holds very true to one of George’s predominant themes: coping with a situation that doesn’t feel right or true. It doesn’t take long for the child in the video to lose himself in the fanciful world he has walked into, but soon enough he comes crashing back into the real world. Fortunately, this story looks to have a happy ending, with his mom at his bedside. No matter what form his December Song took, it saved him from despair and sadness. Don’t we all have a song around the holidays that, no matter what is going on in our lives, lifts us up and puts us right back in the mood for the holiday? For me, that song has always been “Last Christmas”. There is something about Christmas that brings out feelings of melancholy, and I have a deep appreciation for that when it comes around. Even though things feel like they are working against me, I recognize that my life is pretty amazing, and the blessings in my life could fill a whole book. Those moments are cathartic, and I come out of them on the other side with a better appreciation of the moment. I tend to embrace the season much more after that. George’s website mentions that he is working on a new album. Here’s hoping that he continues to share songs that can inspire as deep a feeling as “December Song” does. NME.com is reporting that George Michael has recorded a new Christmas song in conjunction with his recurring role on “Eli Stone”. Titled “December Song (I Dreamed of Christmas)”, the song will be sent to radio for airplay, and will be available as a free download on his website Christmas Day. It’s an interesting move, and signals his first steps into distributing his own music, which he’s threatened to do for quite a while now. So what does George Michael and Christmas mean to me? First and foremost, it’s “Last Christmas”, which is among my top 3 favorite Christmas songs. After years of languishing on dusty shelves across America, it seems as if the song has made a major comeback over the past couple of holiday seasons. Those of you in England may be completely sick of it, but there’s a little bit of justice for me in its resurgence. Most of Wham’s musical output (and George’s, for that matter) has just faded into the mist, so it’s great to see a true gem float back up to the surface. 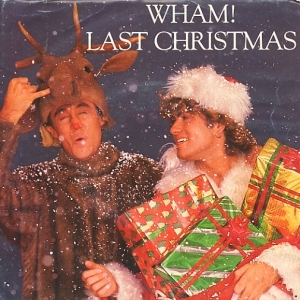 There have been a LOT of covers of “Last Christmas”, but the original is still the best. So now it’s 2008, and what’s the verdict on George’s new entry to the holiday canon? Well, it’s actually pretty good. The opening is a very classic sounding Christmas vocal, but it quickly switches up to a classic George Michael wistful, moody ballad. It’s no “Last Christmas”, but after a couple of listens, I REALLY like it!